André Szymanski in "Land's End"
Following the death of his grandmother, successful architect Marcus returns to his childhood village of Bergstedt for the funeral. There, he meets a group of environmental activists trying to prevent the construction of a motorway through the area, among them the fascinating and idealistic Piglet. There are also the cranky Hering brothers who know secrets from his past he has avoided confronting for years. In the end, Marcus has to decide for what things it is worth getting involved. 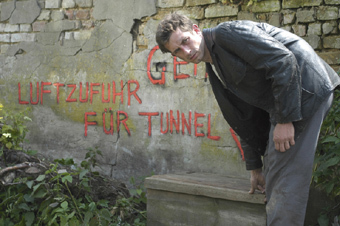 Land’s End is the second collaboration between British writer-director Alex Ross and the renowned ZDF/Das kleine Fernsehspiel (his 1998 film Move On Up winning the Audience Award at the Adolf Grimme Awards in 2000). Nonetheless, Ross, who erroneously claims “I’m not very good at explaining my own film, really!” obviously belongs to the English social democratic school of filmmaking, observing his characters with humor and complete sympathy, setting them within their groups and milieu.